What's perfect selfie? VIVO V5 delivers it perfectly! The Vivo V5 smartphone boasts Perfect Selfie capabilities with its high-quality front-facing camera, fast performance, and upgraded features that ensure great experiences for its users. “The V5 embodies Vivo’s relentless pursuit of innovation, with technologies and functions that our consumers look for in their device. With the V5 and its industry-leading features, we continue to push the boundaries of a premium mid-range smartphone as we highlight Vivo’s high standards in smartphone design and feature,” said Vivo Philippines Vice President Hazel Bascon. The Vivo V5 sports an all-metal unibody shell back case that comes in champagne gold and rose gold colors. Up front, it features a 5.5-inch 1280x720 HD display clad in 2.5D Corning Gorilla Glass for protection, giving the V5 an ideal premium feel in the hand. Performance wise, the Vivo V5 is equipped with a MediaTek MT6750 octa-core processor running at 1.5GHz and paired with 4GB of RAM and 32GB of internal storage expandable via micro SD up to 128GB. The V5 also features a front-facing fast fingerprint scanner capable of unlocking the smartphone in as fast as 0.2 seconds. It also features fast-charging technology to quickly top-up its 3,000mAh built-in battery. The Vivo V5 features an innovation that is set to be the benchmark of future smartphones. It is equipped with a 20-megapixel Moonlight front-facing camera featuring a 1/2.78” Sony IMX376 camera sensor coupled with a 5P lens system and an aperture of f/2.0. It also comes with a front-facing soft-light flash that helps illuminate its subjects whenever they take a selfie, ensuring that its users can capture perfect selfies anytime and anywhere. Meanwhile, its rear camera boasts a 13-megapixel sensor that features phase-detect autofocus that will help users snap photos as they happen. Vivo’s V5 smartphone is also equipped with a 32-bit AK4376 digital to analog converter Hi-Fi chip, as well as a new iteration of its proprietary operating system, Funtouch OS 2.6, now based on Android’s 6.0.1 Marshmallow operating system. Scan QR Code to download soft copy of press release and event photos Among its new features is an improved version of Vivo’s take on multitasking, Smart Split 2.0, which allows users to view two apps side-by-side. Another feature is the Eye Protection Mode, which filters blue light from the screen to protect its users’ eyesights. “With the launch of the Vivo V5, Vivo again sets the benchmark of a premium midrange smartphone with perfect selfie features that one would normally only see in flagship offers. Filipinos will once again have a capable and compelling smartphone choice, and one that can fulfill a wide range of roles in their everyday lives,” added Bascon. Vivo also revealed an upcoming device that is set to supplement the Vivo V5. The Vivo V5 Plus will feature a similar form factor as the V5 smartphone at 5.5 inches, but will feature a 1920x1080 display and 20-megapixel dual front-facing cameras that are set to enhance the perfect selfie experience of its users. Vivo also announced Golden State Warriors point guard Stephen Curry as part of the Vivo family. The two-time NBA MVP and Golden State Warriors point guard will serve as the new face of the Vivo V5, highlighting its perfect selfie capabilities alongside local influencers Mccoy de Leon and Verniece Enciso. 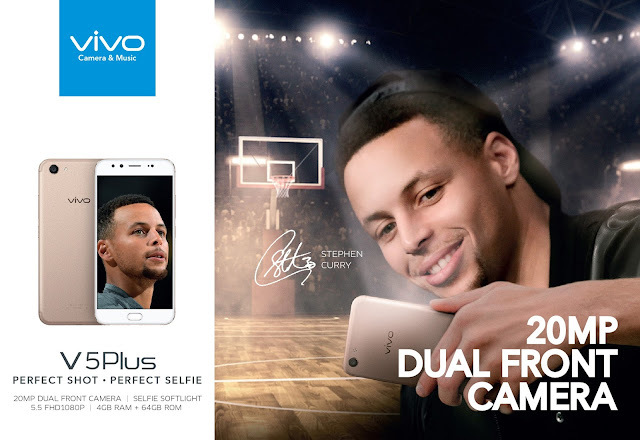 “I’m really thankful for being part of the Vivo family and I’m looking forward to doing more activities with Vivo and its Filipino plans soon,” said Curry. The Vivo V5 Plus will be coming soon on Philippine shores. Meanwhile, the Vivo V5 will be available in Vivo concept stores and major retailers nationwide for PHP 12,990. Consumers can also pre-order the V5 smartphone in major retailers starting November 23 to receive exclusive freebies including Vivo speakers, Vivo selfie stick, and a Vivo-branded phone stent. ** This article comes from a Press Release by Vivo Philippines.